Four years ago, Sidney Rielly was told she would never be an impactful scorer at the division 1 level. Rielly didn’t listen. She intensified her training with Watts Basketball and transferred from Saint Mary’s to a rebuilding Portland State program. In her three years with the Vikings she has become one of the most complete scoring threats in the country. Besides leading all guards in the country in field goal percentage in 2017, she has scored 1,499 points and counting in career. Good for 4th all time at Portland State. Reilly individual success led to her being named All Big Sky first team this year. Her team’s success is even more impressive. The Vikings won the Big Sky Tournament this year in an epic, come-from-behind win on a buzzer beater. 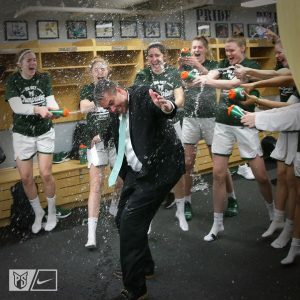 The victory clinched Portland State’s first NCAA tournament appearance since 2010. Their achievement earns them a first round matchup tonight in Eugene against the #2 seed Oregon Ducks. From being told she wasn’t good enough to setting individual records, leading her team to their first NCAA tournament appearance in nearly a decade and playing on ESPN2 tonight at 6pm, Sidney is proof of what you can achieve when you believe in yourself, find the right people to work with and stay dedicated to your craft. For all these reasons she is this weeks Watts Basketball Power Performer.